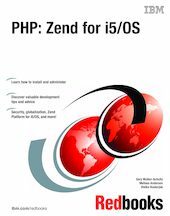 This IBM Redbooks publication will help you install, configure, and become productive with PHP on System i using Zend Core for i5/OS and Zend Platform for i5/OS. If you are evaluating PHP, this book will also help by providing background information and comparisons with other tools. Emphasis has been placed on highlighting i5/OS-specific functions and features in this book rather than those generic to PHP on all platforms. Chapter 1. Welcome to PHP on i5/OS!